Posted June 7, 2016 by Sue Peffer & filed under News. 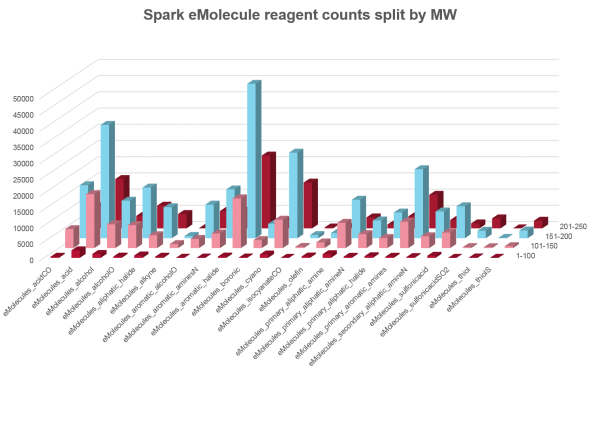 Cambridge, UK – 7th June 2016 – Cresset, innovative provider of software and contract research services for small molecule discovery and design, is pleased to announce the release of the new Spark reagent databases based on available compounds from eMolecules. This will enable researchers to use Spark to find the best R-groups for their projects, whilst also enabling a close link between Spark’s suggestions and the chemistry they want to use, based on reagents they can easily procure. eMolecules is driven to remove the fear, hurt and heartbreak of health problems worldwide, by enabling scientists to accelerate their research to find the cures. To achieve this eMolecules provides business intelligence data and integrated ecommerce software for screening compound, chemical building blocks and primary antibody supply chains. These tools combined with their acquisition, aggregation and analytical services greatly empower drug discovery researchers working in the pharmaceutical, biotechnology, academia, CRO and agrochemical industries. A privately owned company, eMolecules was founded in 2005 at its San Diego headquarters and has offices in Boston and London employing over 40 people across the three sites. For more information visit https://www.emolecules.com/.